Shadow banking has grown by leaps and bounds around the world in the last decade. It is now worth over $70 trillion. We take a closer look at what has driven this growth to help countries figure out what policies to use to minimize the risks involved. In our analysis, we’ve found that shadow banks are both a boon and a bane for countries. Many people are worried about institutions that provide credit intermediation, borrow and lend money like banks, but are not regulated like them and lack a formal safety net. The largest shadow banking markets are in the United States and Europe, but in emerging markets, they have also expanded very rapidly, albeit from a low base. The Financial Stability Board offers a broad definition of shadow banks as nonbank financial intermediaries engaged in credit intermediation (including investment funds), and a more narrow one which excludes entities which do not directly undertake credit intermediation or which are consolidated into banking groups. We compute another measure, derived from flow of funds accounts, for a smaller set of countries. It focuses on “other financial intermediaries” and excludes non-money market investment funds, since the latter mainly manage assets on behalf of clients and thus do not engage directly in credit intermediation. Lastly, we propose a new, alternative definition of shadow banking as financial activities using nontraditional funding, independently of the financial institution involved. The focus on activities is one advantage of this approach. For example, securitization is classified as shadow banking, whether it is conducted on-balance sheet by banks, or off-balance sheet through special purpose vehicles. These measures show some notable differences for the United States and the euro area. They all share a similar growth trend until 2007, after which their paths diverge markedly (Figure 1). After a mild drop around 2008, the Financial Stability Board’s measures now surpass their pre-crisis levels. Positive valuation effects are one of the reasons behind the pickup in the Financial Stability Board’s measures, given the growth in the investment fund industry. In contrast, our measures remain broadly constant or have fallen, which reflects two opposing forces: the decline in the role of certain activities after the crisis, such as securitization and securities and repo lending, and a concomitant rise in other activities, includ­ing those of country-specific entities, such as special financial institutions in the Netherlands and U.S. holding corporations. For broad monitoring purposes, it may be good to keep an eye on various measures, as they may capture different developments across the shadow banking spectrum. What drives shadow banking? Our analysis shows that shadow banking growth is associated with GDP growth, low interest rates and low term spreads (inducing search for yield), bank capital stringency (capturing regulatory circumvention), and with growth of institutional investors (Figure 2.A). Controlling for these factors, there also appears to be some complementarity with the size of the banking sector. Looking forward, the current financial environment remains conducive to further growth in shadow banking. Many indications point to the migration of some activities—such as lending to firms—from traditional banks to the nonbank sector. 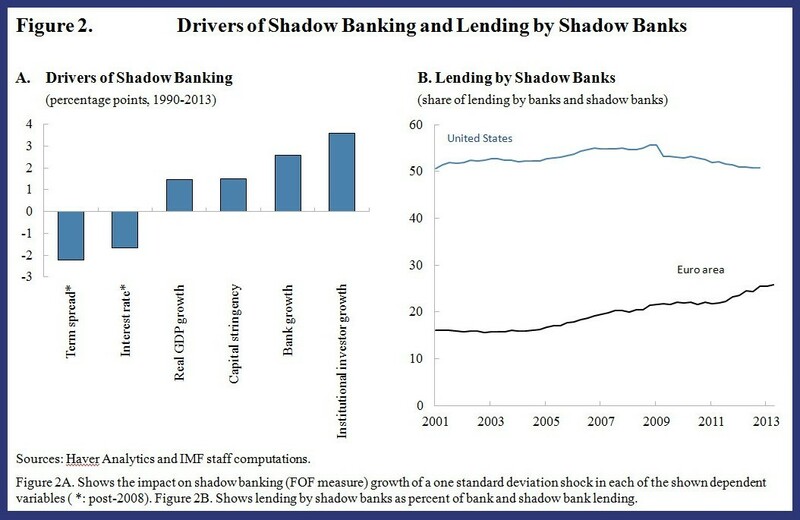 Especially in the euro area, the growth of lending by shadow banks seems to gather force, while its share of total lending remains high in the United States (Figure 2.B). The analysis in our report shows that in the euro area and the United States, investment funds, traditionally considered less risky (think PIMCO or Blackrock) have been growing the fastest since 2009—but taking on more risk. Some of these funds have been venturing into less liquid assets, including loans to companies. We recommend policymakers should keep an eye on how different shadow banking activities and entities grow and may contribute to systemic risk. 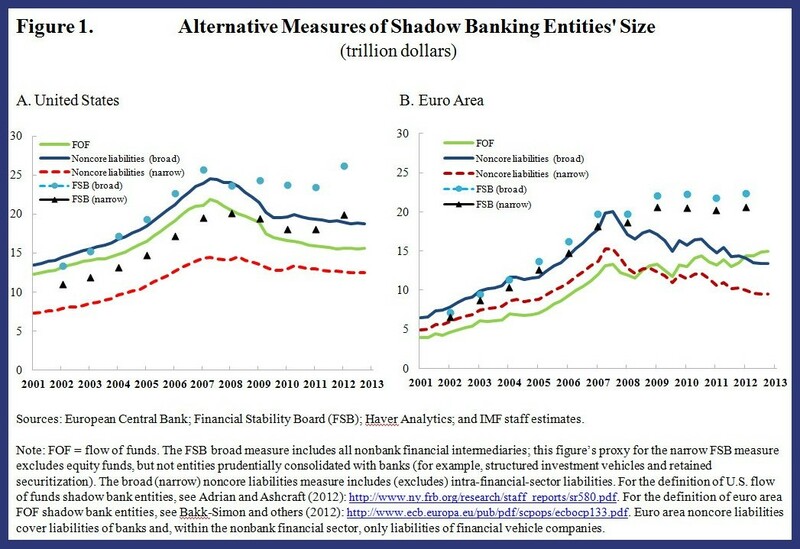 We need more data on balance sheets of shadow banking entities to improve our understanding of the risks that shadow banks (and their growth) may pose—that is, whether they engage in excessive maturity or liquidity transformation, how much leverage is involved, how risky their credit positions are, and how interconnected they are with the rest of the financial system. So far, such analysis can only be undertaken in very broad terms for some broad shadow banking sectors. Hence, a definitive assessment of whether the growth of shadow banking is good or bad for financial stability cannot yet be given – but there are indications of risk build up, at least in some sectors.